How do you visualize a world you haven’t yet seen? 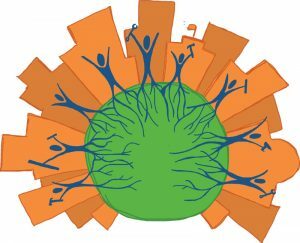 Earlier this year, I did some graphics work for the Family Leadership Design Collaborative (FLDC), a group whose mission is to radically re-imagine family engagement in schools and other institutions. It turned out to be one of the toughest design challenges I’ve faced. In this post, I want to share a bit of that design process with you. The back-and-forth that the process inspired — with me offering draft images and them giving critiques — was fascinating on its own. But more than that, this project exemplified some of the tensions I’ve struggled with over the years creating visual communications for social justice groups. One of these recurring tensions has to do with the use of symbols. Infographics and other visualizations often rely on simple, widely-recognizable symbols to communicate ideas. We know instantly that a paintbrush means art, a graduation cap means education, and two tall figures and two short figures means family. These symbols serve as visual shorthands, allowing images to be comprehended quickly, and by a broad audience. A social justice perspective, however, values diversity and inclusiveness. There is no one kind of family, no one educational path, and to simplify these ideas into universal symbols is to marginalize those who deviate from that single image. In addition, social justice is often about imagining how the world could be. That can be hard to do using symbols that are based on the world as it is — particularly if you’re not totally sure what the future you are fighting for will look like. But the farther you stray from the dominant culture’s symbols, the less you can assume that viewers will immediately recognize your meaning. These are not insolvable dilemmas. Many artists are navigating them creatively. Here’s a story of one of my attempts. I hope it offers some useful insights; I certainly learned a lot. And since I recently critiqued another person’s visualization, it’s only fair that I share some of the critiques I’ve received — all of which, ultimately, have led to better designs. Ann Ishimaru, a professor at the University of Washington, approached me with the job. She and her colleague Megan Bang had received funding from the Kellogg Foundation to bring together a group of nationally-recognized community organizers, educators, and researchers from around the country for a two-day meeting. The topic under discussion was family engagement — the practice of supporting families as leaders, advocates, and collaborators in schools and communities. Ann, Megan, and their colleagues were not content with the current state of “best practices” in family engagement. Their goal was to to develop “next practices” — approaches that go beyond what we’re doing now to what is possible tomorrow. They wanted to center racial justice and the voices of “nondominant” groups, with the ultimate goal of “family and community wellbeing and educational justice.” Ann wanted to capture all this in an image to share at the meeting. We began with a couple different concepts. One was Tupac Shakur’s metaphor of “the rose that grew from concrete,” which is about the strength and beauty of people who learn to thrive despite facing significant life challenges. Ann wanted to expand the metaphor to explore what was happening below the surface of the concrete, as well as the broader ecology around the rose. 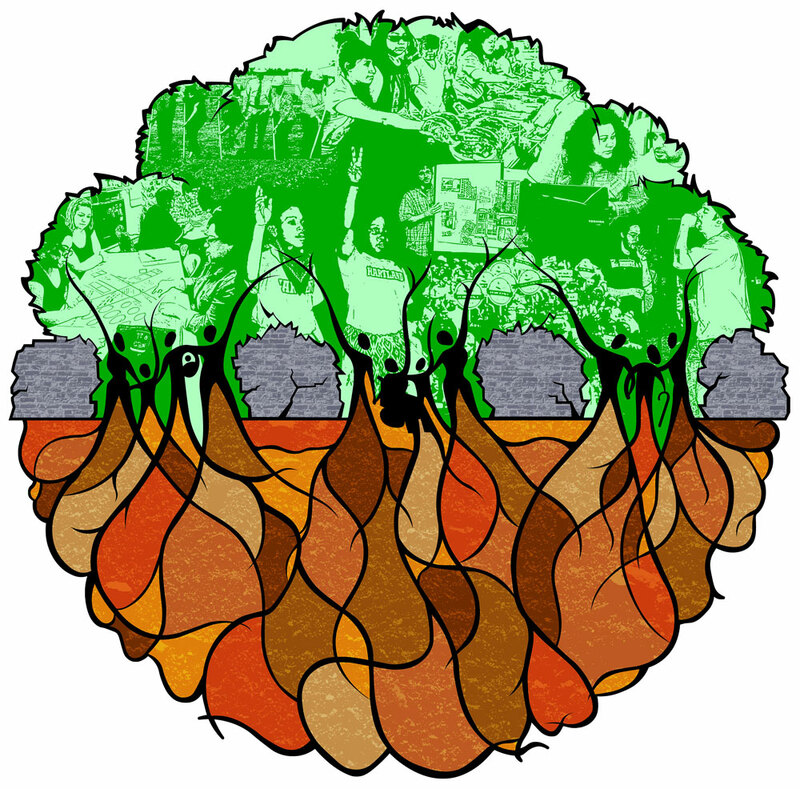 Another concept was root systems. 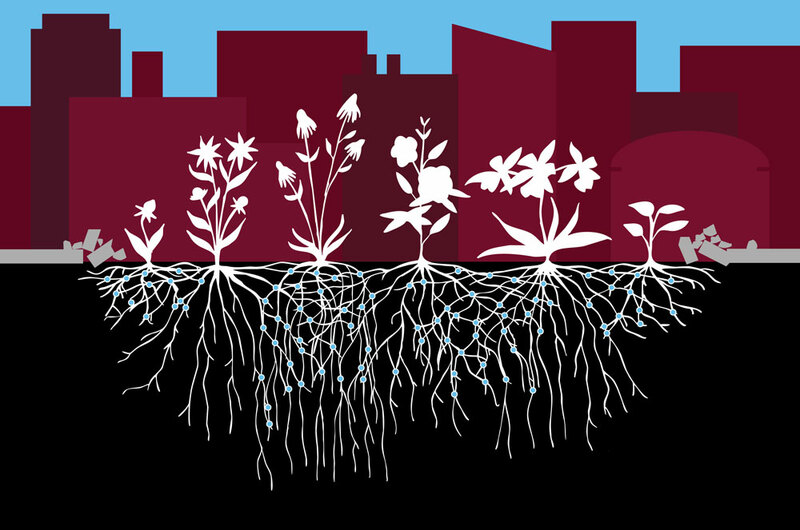 The root systems of plants are often much more extensive than you’d expect, just as there is much going on beneath the surface in marginalized communities that goes unrecognized by outsiders. 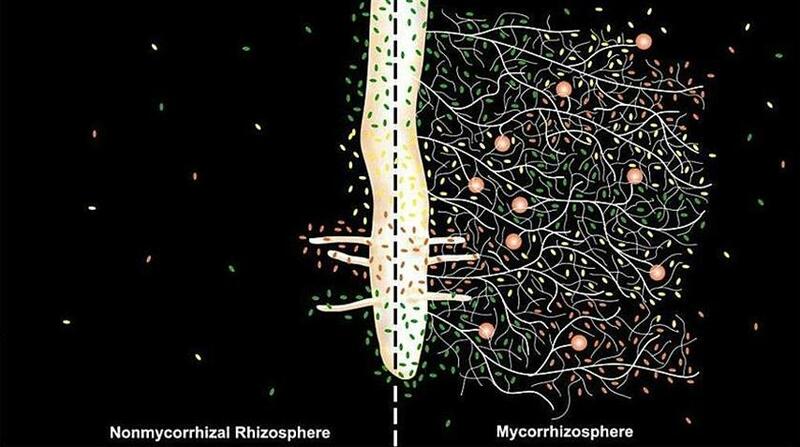 As a starting point, Ann shared with me the image below, showing a fungus that that attaches to plant roots. She liked the way the tendrils were interconnected through nodes, which suggested ideas about human interconnectedness and networks. After some back and forth, I drafted the image below. I carefully selected flowers from different climates around the country to communicate the diversity of the gathered group. I also used flowers at different stages of growth, to symbolize inter-generational collaboration. 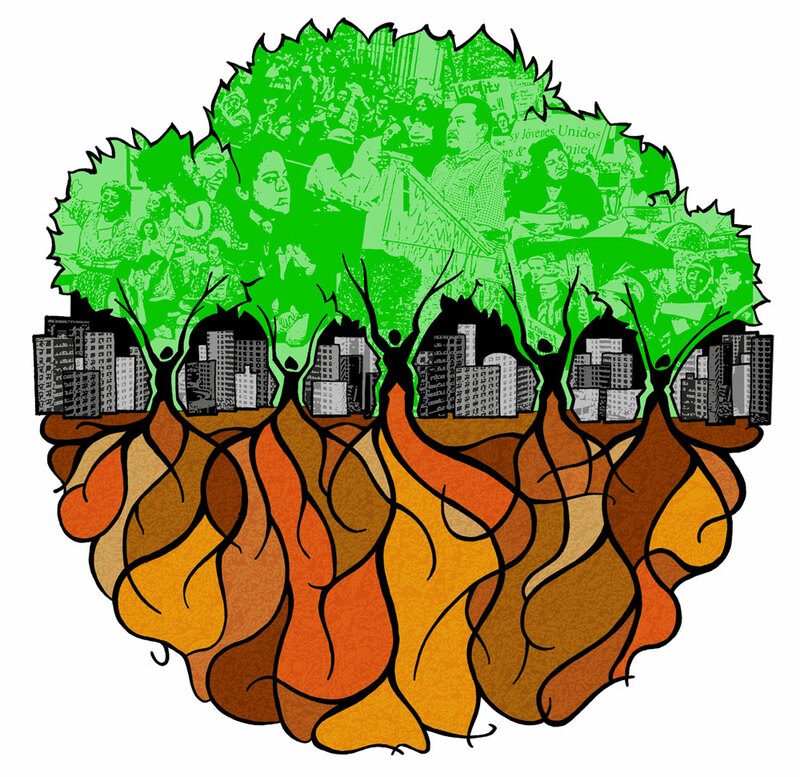 The urban landscape signified the broader ecology within which family engagement took place, as well as the large, often inaccessible institutions that families had to navigate. 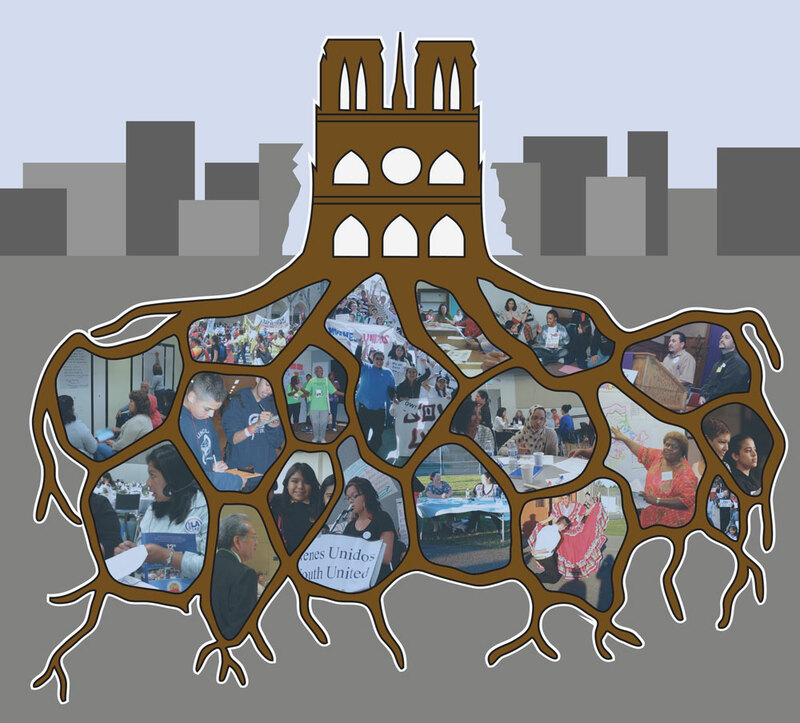 Linked root systems signified networks of mutual support, and a rootedness in shared history and culture. In conversation with Ann and Jondou Chen, the project director, I began to sketch out a new image that showed people with roots in the ground. The people had tools in their hands, to symbolize the building of new types of institutions. But Ann and I agreed that it was getting a bit too “we are the world,” and losing any indication of oppression and struggle. At this point I realized I needed to shift my design approach. Simple stick figures could never capture the full humanity of people, or the complexity of family leadership across all the different groups involved. What if I used actual photographs? This idea led to the image below, based on Ann’s description of “a system of education that starts from the roots and strengths and cultural practices of different communities.” What would such an education system look like? (I used photos from an older project on community organizing for these early drafts, so thank you to all the groups featured!). Ann and Jondou liked the photos. However, they said the root system looked like a honeycomb. Also, they really didn’t like the top part. It was immediately clear, when they looked at the image, that the idea of a new institution as the end-goal wasn’t right. (I wasn’t thrilled with it myself, since it ended up looking like a cathedral, which is culturally specific and has its own baggage). Having an idea rejected like this can be frustrating, but over the years I’ve realized that this is one of the more helpful services visualizations can offer. By having their words reflected back to them as an image, they were able to clarify what they did not mean, and the dialogue moved forward in a better direction. The image came across as too individualistic. Each person was on their own, rather than connected to larger families or communities. As an alternative, they suggested multiple figures in groups, with arms/branches connected. The landscape, at least to some, read as literally urban (rather than as a metaphor for unwelcoming institutions). They worried this was not inclusive of groups working in rural areas. They wanted more age diversity among the figures, because so much of the work was intergenerational. After a few more rounds of back-and-forth, we landed on the image below. In the end a wall, rather than a city, was used to symbolize the barriers faced by families. I drew inclusive, diverse groups of connected people, which purposefully did not read as traditional nuclear families. To be sure, it not the kind of graphic whose meaning is immediately clear to a viewer. Rather, it invites exploration, explanation, and discussion. It is as much about the feeling of the work as about the idea of the work. Though it took a long time, and many re-drawings, ultimately the critiques greatly improved the design. In addition, the design process helped Ann and her colleagues clarify their own mission, goals, and values. Now the FLDC is running collaborative research projects in communities around the country, and I’ve been told that one group used the image to guide their discussions. They asked participants to describe how race and class have shaped their own histories (the roots); to write their hopes and dreams for their children, schools, and communities on cut-out leaves; and to use white note cards as “walls” to represent the barriers and challenges to realizing those hopes and dreams. All around, a success, though I wouldn’t be surprised if we continued to adapt it going forward.